Teacher Evaluations are a huge issue right now. How do we evaluate a teacher in the performance of their job? Some people think test scores are the answer (most educational experts disagree, for good reason). In order to answer this question, let's look at how some other industries evaluate employees. These are all jobs that I have held, or hold now. 1. Cook - I worked my way through college as a cook for two different restaurants, one independent, and one a national chain (The Chart House). Our evaluations were based on the following areas: attendance, on-time to work, attitude, skill (making the food correctly), ability to handle stress during busy times, interaction with other employees, and ability to follow directions from management. 3. EMS-Instructor - I have been an EMS-Instructor for 12 years and an Instructor-Trainer for 8 years. I evaluate new instructors all the time, and I also help evaluate the instructors on staff at our training center. I teach the instructor courses and evaluate students during the course. They get evaluated by their mentor instructors in real classes. The one thing we do NOT use to evaluate our instructors is the test scores of their students on the National test. No one instructor is responsible for a student's learning, just like in education. We evaluate the instructors on content knowledge, lesson activities and pedagogy, student engagement, classroom management, attitude, attendance/punctuality, and student evaluations.We do multiple assessments of new instructors and then we continually assess the effectiveness of our instructors. Our training center has high standards and we expect our instructors to live up to those standards. Instructors are counseled and assisted with any areas of need. Only those who do not improve after multiple attempts at being helped are not brought back. 4. Engineer - I was an engineer for 10 years before becoming an educator. I was a project engineer and had employees working for my team that I had to evaluate, and I was evaluated by my supervisors. We were evaluated on a variety of areas, similar to the other industries above. If our design failed or had problems, we weren't fired or chastised, we were expected to fix the problem and offered help and support to do that. We weren't held responsible for the actions or performance of the people building our design. This is how education should be. Evaluation criteria: job knowledge and skills, quality of work, organizational skills, problem solving, communications, flexibility, teamwork, personal development. Then the employee and supervisor would have objectives for the employee to work on for the next evaluation, a Person al Action Plan for improving any areas of need, and employee feedback and input into the evaluation. Our current evaluation forms for teachers are similar. Managers were trained in how to evaluate their team members. They had very specific tools and resources to use to do the evaluations. They saw what their team members were doing on a daily basis. Administrators need to see and observe teachers more often than many do now. 5. Educator - Our evaluations are currently based on administrator observations (1 formal and some informal). We are evaluated on content knowledge, lesson plans and objectives, pedagogy and lesson activities, assessment, and classroom management. There is a structured support plan for improvement also. The problem is that there are not enough observations done, administration is not trained on truly evaluating an educator, and student work is rarely evaluated. I believe that we need administrators, and not the same one all the time, observing teachers more often, and we need more than just test scores, objectives on the board, etc. evaluated. More emphasis should be placed on what the students are doing in the class, how they are learning, and what they are producing. Look at the students' entire portfolio of work in a class. I also think that administrators need more training on how to evaluate teachers. It needs to be objective for most of it, with some subjective areas. However, no one evaluation should be punitive for a teacher. Multiple administrators need to evaluate a teacher, and a teacher needs to be given support and training to improve in areas of need. Many times, teacher evaluations are too subjective, and personal issues come into play when they have no place there. The evaluation of educators should never be based on test scores. There are too many factors that affect a student's performance on a test that has nothing to do with their teacher. Plus, no one teacher is responsible for the everything that student knows or doesn't know. Educators should be evaluated on the following areas, and by multiple people: content knowledge, lesson plans and objectives, pedagogy and lesson activities, student engagement, assessment, and classroom management, effective use of technology and resources, innovative lesson ideas and projects, student portfolios and student evaluations (like we have in college). The student evaluations should only be used to find and address issues, not as a punitive measure. The main focus of the evaluations and observations should be "are the students learning?" and "how can we improve student learning more." Period. Some new laws around the country (and proposed in CT) are changing teacher evaluations to be based on on administrators' opinion and test scores. Neither of which is effective or accurate. The people evaluating educators need to be trained on how to do the evaluations and what to look for. Educators should be evaluated by more than one administrator and on other factors besides that administrators observations. Educators who have and issues or areas that they are struggling in, should be trained and supported, not attacked or fired. Educators, like any other employee, who do not improve after proper training and support, can then be let go. Some business practices can be used in Education. 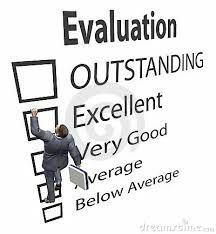 Lets use some of the employee evaluation tools from other areas in education. Education policies also need to be based on scientific research, data, best practices, and advice from professional educators. Politicians and the public are not educational experts. They need to listen to the experts. Remember, our goal is always to improve the education of our students. Attacking teachers does not do that. If what we are doing does not help our students, we shouldn't be doing it.